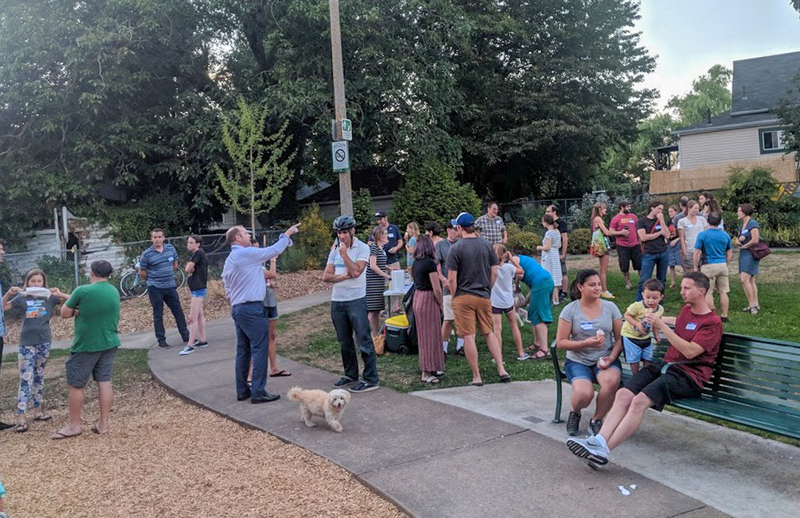 Our goal was to create a low-stress environment for neighbors to meet each other and talk about the City of Portland’s proposal to turn 7th Avenue into a traffic-calmed neighborhood greenway. My wife Kate and I loaded up a cargo trailer with tables, a PA system, signs and name tags, and headed over to Two Plum Park. With only 30 minutes until the scheduled starting time, we nervously began setting up. Two Plum Park is located on NE Shaver and 7th. Under the proposed 7th Ave plan the park would be extended across 7th. There would be a path for bicycle riders, but car drivers would not be able to cut through. This park is very important to the community. It began when a neighbor named Joe Martin bought a lawn mower at Goodwill and began mowing the lawn on some vacant lots. Other neighbors joined and the lots became a social gathering spot. These neighbors then persuaded the city to purchase the lots and turn them into a park in 2001. 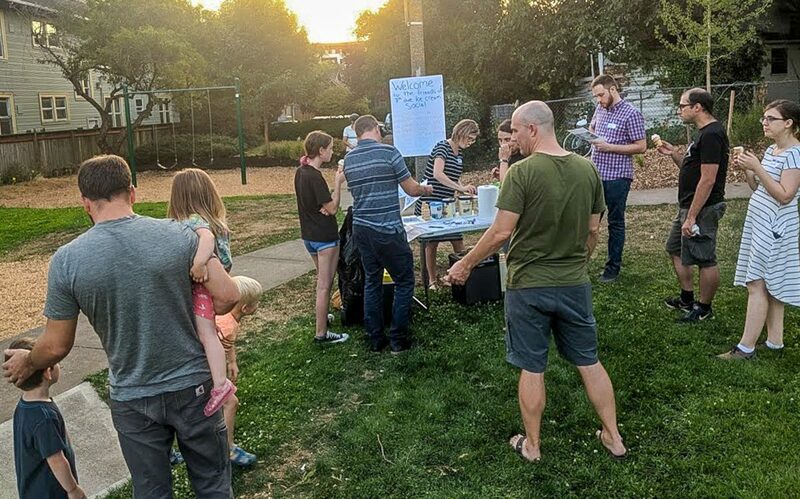 This history and the potential to expand the park as part of the greenway made it the ideal location for our ice cream social. As if on cue, right at 7:00, families started appearing. Kate took to serving up the ice cream and I went around welcoming people and encouraging them to get name tags. For Kate and I, the evening was a rush. At the beginning I made an announcement telling people about what led up to this event and what we were all here to do. Over 50 neighbors came out to meet each other and discuss the proposal. There were a lot more people then we had hoped for. Maybe it was just the free ice cream. The lack of intensity in the conversations was a welcome contrast to the passion that can fill a Portland Bureau of Transportation (PBOT) open house. I had several copies of the proposed plans that people used in their conversations and also made a list of question prompts. The most amazing thing for me was that it actually worked. People ate ice cream and talked with each other about the proposal. No one cried, no one wrote any angry messages, but there were lots of kids playing and people being friendly to one another. People stayed out until the sun went down and the mosquitos came out. That evening, a community gathered. I talked with one mother who was very nervous because she had just started letting her daughter walk to school by herself. She introduced us to her daughter so that we could keep a eye out for her. Another couple had just moved in from Philadelphia and were loving Portland. Kate talked to one woman who was ready to build her own speed bump in front of her house. People expressed their concerns about climate change and that we were not doing enough to stop it. There were a few people that had come a little hesitant about what these changes would do but after talking they seemed okay and even excited about them. Felix and his dad Roberto. On the invite I included an invitation to teach anyone how to ride a bike and offered to let them borrow one. I got one response. 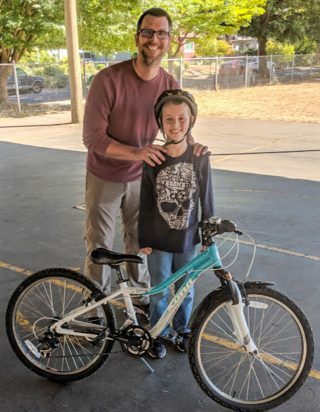 Felix, who lives down the street from me, was a little nervous about riding a bike in from of his classmates at school. So I removed some cobwebs from a loaner kid’s bike I had used during my bike train days and met him and his dad at the park. We first practiced with the pedals off but he quickly mastered that, so we put them back on and had him start from an incline. On his first try he got his feet on the pedals and starting pedaling! He only stopped to raise his fist in the air in triumph. I can only hope this greenway project ends as well. 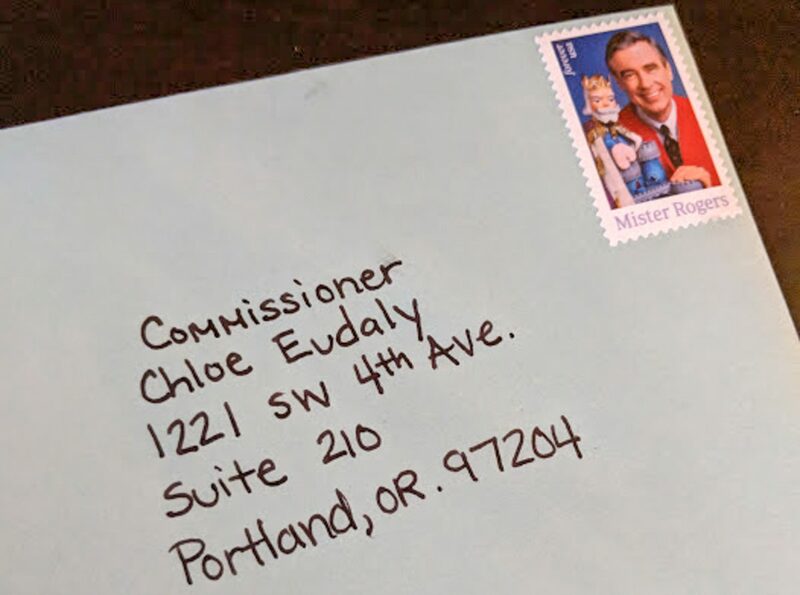 The answer is to continue to get to know one another and work at making the community that we all want to live in, as well as emailing and writing letters to PBOT Commissioner Eudaly. In December our first child will be born. It is my hope that she will get to ride her bike safely on a NE 7th greenway to get to Two Plum Park. If she’s lucky maybe she’ll pass by Felix on his bike going to high school. I am so impressed by this, great work! This is so awesome Kiel. Thank you for doing it and for allowing me to share it here on BP. One thing I noticed in the photos is that the crowd is all white people. I know the demographics have changed a lot since people of color far outnumbered whites in this area as late as the early 2000s.. But I’m just curious.. Did you talk to any of them in your door-knocking and they just didn’t show up? Or any thoughts on that? While the crowd was majority white it was not entirely white people. I had hoped that by knocking on everyone’s door we would reach some people mentioned in the Scanner article. When I went knocking on the doors at the Margret Carter apartments there were no white people, which says a lot about income inequality. While I had some great conversations there I was disappointed that it didn’t appear as though anyone from those apartments showed up. (I have been thinking about trying to organize a block party on that block) I also made a special effort to reach out to the NE Community Church and followed that up with a phone call. The receptionist said that the pastor was going to try to make it but again unfortunately he did not. Similarly, with the Albina Head Start office (who have raised some concerns about the project) on 7th and Fremont where I contacted them four times. I do not know what the answer is but I think that knocking on everyone’s door and reaching out in a none confrontational way is a first step even if everyone doesn’t feel comfortable meeting as a group. What are other people’s thoughts? Thanks for sharing that Kiel. I agree that it could be that the porch conversations are a great first step. I think you’re doing exemplary work by just by reaching out being out there and being available. Jon and Kiel, I’d be wary of the term and concept of “white people” in Portland. When I lived in East Portland I met a lot of immigrants, refugees, American Indians, and Latinos/Latinas who for all intents and purposes looked “white”, but identified themselves otherwise. Yeah, your area used to be up to 70% black just 2 decades ago and is now no more than 5% African-American, but that doesn’t exclude the possibility that other non-white “minorities” have since moved in and/or continue to live in your neighborhood. There’s a very high probability that your 50 participants more or less proportionally represent the many communities of your neighborhood, by race, ethnicity, gender, gender-identity, age, income, etc. However, I do need to compliment you on finding the 50 most civic-minded folks of your neighborhood! I love this so much. You are a true mensch! I’m glad to see this kind of outreach for the project – I haven’t been riding 7th much lately despite it being the most direct north-south route from my house, because Williams-Vancouver (even in rush hour traffic, with terrible drivers) is just plain safer. Has there been any more discussion about what exactly will happen with the “crossing improvements” listed in the project sketchbooks for the intersections at Killingsworth and Alberta? If the plan is simply to slap some green paint there and call it good, those two streets will still be a barrier to anybody who doesn’t feel confident interacting with high-speed car traffic. I live on Killingsworth; in the three years I’ve been in my house, I’ve seen four parked cars get completely totaled on the block of 9th and Killingsworth. Three times while bike commuting on 7th, I’ve had to divert around an accident at the intersection of 7th and Alberta that was severe enough to require both streets closed. Neither of these intersections are safe enough for your average cyclist at the moment. Adding paint won’t fix that. Most of the improvements further south sound fantastic, and I’m really excited for them to be implemented; as a confident road cyclist, I’ll happily use this route any time I need to get to SE Portland. It’s just a shame that so much consideration is going toward a relatively wealthy part of the route, while the stretch from Prescott to Killingsworth (which is lower income, and also has an elementary school on it) is getting the infrastructure equivalent of lip-service. Is the MLK cut-through traffic as bad between Prescott and Killingsworth as it is between Broadway and Fremont? Honest question. It’s rather ridiculous south of Fremont in the evening rush hour. I can’t recall seeing it be that bad north of Fremont to Killingsworth (I don’t ride north of that too often), but then I’m usually not riding during commute hours then. Until I totally change my route to come at the neighborhood from the south via 16th instead of the west via Knott and Siskiyou, those three blocks from Knott to Siskiyou were filled with an awful lot of aggressive drivers treating it like an arterial, including getting yelled at to “move over!” on the narrow lane. Car traffic on 7th north of Irving drops off dramatically, which does make it usable enough that I don’t have a problem with riding it personally. The bigger issues are the two intersections themselves, not from parallel car traffic on the greenway – Alberta is definitely a risky cross (people run the light there all the time), and Killingsworth doesn’t even have traffic controls beyond a stop sign *against* the greenway. I’ve had the same experiences as you closer to Lloyd Center, which is why I’m personally happy about these changes. I’ll definitely use this greenway more if that section is resolved, and I like what they’re doing to fix it; speed bumps just make things worse, the diverters they’re adding are the real meat here. It’s just disheartening to see the improvements get very vague once you cross from the wealthy, mostly-white neighborhood to the lower income, more diverse section. I’d posit that might also be part of why Kiel is getting such positive responses, and the Skanner article reported just the opposite. One section of this project is getting expanded parks, added green space, and actual concrete to improve crossings. The other section gets green paint. If you live in the green paint section, and someone from PBOT says they’re going to spend millions of dollars putting that green paint down, you’re probably not going to be thrilled. They didn’t even bother to make mock-ups of those intersections, although to give PBOT the benefit of the doubt I’d assume that’s because the Alberta and Killingsworth crossings are the same in both routes. Thanks for the thoughtful reply. One thing I noticed about the Scanner article: very little support for its outrage in the comments. In fact, last I looked, there were only three comments in glowing support of the 7th Ave alignment (two from white commenters, one from a black commenter). Props for bringing name tags. Nicely done all the way around. Really great job Kiel. 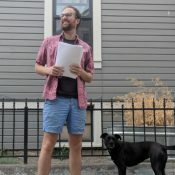 Collect emails and start a neighborhood mailing list! I love this. Let’s work a skate feature into this build! Did you know that the Tillamook Greenway is proposing traffic calming for NE 7th, Knott to Hancock, similar to what the Morris/Siskiyou/Klickitat Greenway did north of Knott?